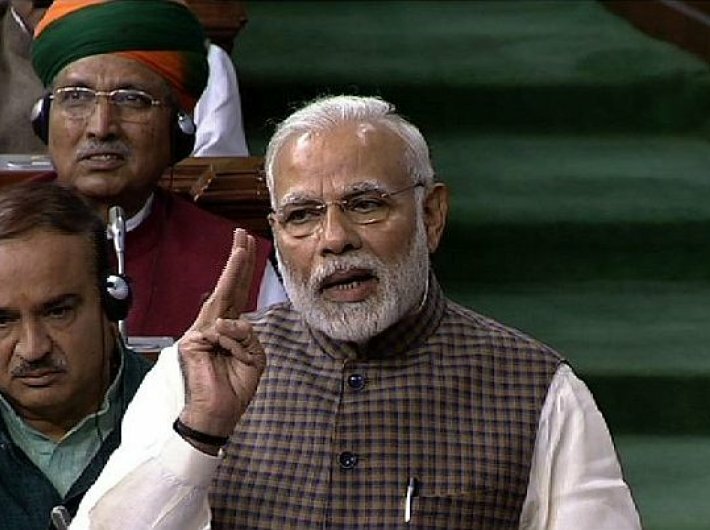 As prime minister Narendra Modi on Wednesday walked across the aisle to reach both houses of parliament, Lok Sabha and Rajya Sabha, for his reply to the motion of thanks to the presidential address, he subconsciously recited this rhyme penned by Sant Basaveshwara, a Hindu social reformer from Karnataka, spiritual guru and statesman of 12th century. Neither anger nor aggression was in his heart as he mulled over Lord Basava’s words that defined the democratic spirits and Indian spirituality in clear terms much before Magna Carta, the founding text of western democracy, came into existence. Modi was his usual self, entirely focussed on delivering his customary speech. As soon as he entered the hall, he realised that a belligerent opposition was hell-bent on disrupting his speech. Perhaps for the first time in the history of parliament, there was a determined attempt by the opposition to disrupt the PM’s reply to the motion of thanks. Modi instantly made up his mind to turn aggressive – not emotionally but as a part of strategy. And right from the word go, he launched a calibrated aggression to rattle the Congress whose strategy to shout down the PM recoiled on it rather badly. Modi raised the decibel level of his voice to neutralise the slogan-shouting from the opposition benches. Yet he punctuated his speech with his unique sense of humour, political sarcasm and at time intense ferocity in both the houses. Take for instance the manner in which he ticked off voluble Renuka Chaudhary of the Congress who laughed out loudly in the midst of his speech. When the chair, M Venkaiah Naidu, raised objection, Modi intervened and said, “Let her laugh; it is for the first time after the Ramayana serial that we are having a good fortune to hear such laughter today.” Those who understood the meaning of the PM’s message broke into peals of laughter as in the serial such laughter was associated with demon king Ravana. In Lok Sabha when he began his address amid slogan-shouting, Modi firmed up his resolve to bring out all those issues that will make the Congress leaders, particularly Sonia Gandhi and Rahul Gandhi, squirm in their seats. In addition to raising the issue of ‘dynasty’, the emergency and corruption, he particularly referred to the manner in which Andhra Pradesh was divided to carve out the state of Telangana. He pointed out that while the Congress created Telangana after bifurcation of Andhra Pradesh for political considerations, former prime minister Atal Behari Vajpayee created Uttarakhand, Jharkhand and Chhattisgarh for reasons of good governance. Obviously, the reference to Telangana was not part of his original plan for the speech. When a group of Congress MPs from Andhra Pradesh attempted to disrupt the house proceedings, Modi instantly took up the cudgel and put them on the back foot. By all indications, the PM’s aggression was a political act which had the least of emotion and much of a sound electoral strategy. For example, the way he took a dig at the leader of opposition, Mallikarjun Kharge, was quite clearly aimed at addressing a constituency in Karnataka which is set to go to polls shortly. He referred to Kharge’s speech and pointed out that his eulogy to the ‘dynasty’ is only aimed to keeping intact his position in the Lok Sabha. He particularly took objection to Kharge’s postulation that the democracy is bequeathed to the nation by the Congress and Pandit Nehru. “You are insulting Sant Basaveshwara,” he said referring to the revered Lingayat saint, who is believed to have organised an open parliament called “Anubhava Mantapa” which promoted participation of people without discrimination of caste and gender and was aimed at collective decision-making. Obviously, Modi was astute enough to send out a message to the people of Karnataka that the Congress leaders of the state have been negating their rich historical legacy just to please a dynast in Delhi.